Frieda Loves Bread: Make Ahead Bacon, Anytime! 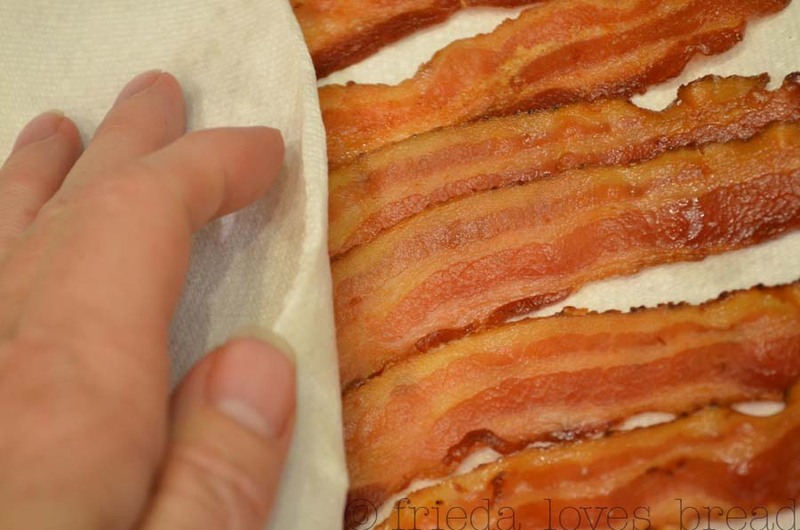 10 Make Ahead Bacon, Anytime! I love the thick sliced Wright's Maple Bacon at Sam's Club. Unfortunately, we are basically empty nesters while son #2 is away at college. I had to find a way to make a large package of bacon last for just the two of us. Raw bacon only lasts about a week in the fridge, so it is best to cook it all at once. Once cooked, it will last 5-7 days in the fridge. You can freeze raw bacon, but I have found that after a few months, I have noticed a lack of flavor. 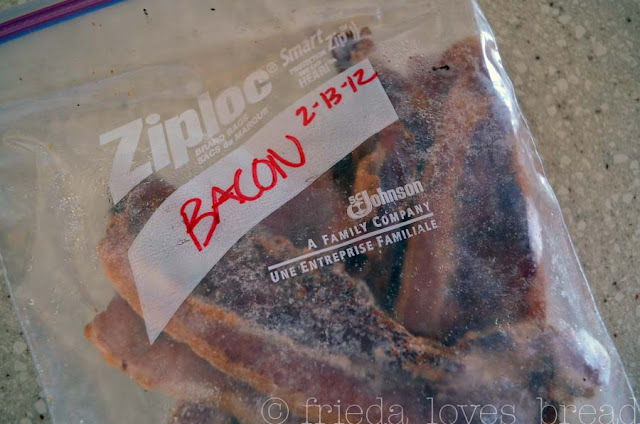 I have kept the original vacuumed sealed package of bacon in the freezer and cut the frozen package in half. I would cook up half and put the other half in the freezer. This worked okay, but I still had to thaw out the bacon and had more bacon on hand than I wanted. This is what I do now: I cook up ALL the bacon (only one day of my house smelling like bacon!) using the method shown in this post. I have thought about cooking bacon in my oven, but the thought of grease spattering and burning in my oven and the smell getting into some of my baked goods (bacon infused sugar cookies, anyone?) just didn't seem right. I put my cooked and cooled bacon in a freezer Ziploc baggie and toss it in the freezer. Now I can take out a slice or two at a time, wrap it in a paper napkin, zap it in the microwave for 20 seconds for a sandwich, breakfast, or cut it up for a salad or omelet. Cooked bacon can last up to six weeks or more in the freezer. If you have a FoodSaver, you can make it last even longer, 3-4 months. I love having cooked bacon, ready any time! So glad you are sharing this great tip, Frieda! My church has Easter Breakfast which our pastors cook for 200+ people each year and I pre-cook the bacon for them using the same method as you. 400+ slices of thick-slice bacon! yeah, I smell like bacon for sure. I never thought of doing this for a large group ~ what a great idea! That's what I do with bacon. It's so nice not to have the bacon frying mess for just a couple of slices, isn't it? And my hubby loves his bacon. We love Wright's plain bacon but we can't get the big package at the Sams we shop since we moved. I can get smaller packages at Walmart. Thank goodness, hubby was going into bacon withdrawal because we couldn't find a good substitute at the grocery store. Yes, it is nice not having a big mess and smell for just a couple of slices! Good to know Wright's bacon is available at Walmart. Sorry, meant to say I bake mine though.Don't have an electric griddle. 400 degree, oven-broiler pans sprayed with cooking spray and I start with 18 minutes for the thick sliced. Then flip and however many minutes to get it nearly done. Then the same microwave treatment to get it crisp and done. I just tried cooking bacon in the oven last week. I covered a cookie sheet with aluminum foil to make cleanup a cinch, and also put another layer of foil over the top of it so the grease wouldn't splatter everywhere. I was pleasantly suprised at how the bacon turned out. I think it was a couple days after that I made some muffins in the oven, and they didn't have any bacon flavor at all. I thought cooking the bacon in the oven was really easy, and will definitely do it again. Thanks, Debbie! I'll have to buck up and give it a try! I like the idea of putting another layer of foil over the top to keep the spatters to a minimum. You're so smart! I've taken to buying the pre-cooked bacon from Sam's. I keep it in my freezer and use four pieces every morning for my breakfast omelet. I found that it crumbles better when frozen than when refrigerated, and obviously it lasts longer.